The Shangdu Road design is to become a major feature of Zhengzhou City. It traverses Zhengzhou’s vigorous urban business district, finest livable neighborhoods and contains functions such as ecologically balanced residential zones, commerce and trade structures, business and office buildings, and entertainment functions. Highlight the city’s individuality, uniqueness, and natural attributes to attract more visitors and commerce, establishing the brand new landmark. Qilihe River is the most popular waterfront destination in the area. The city acts as a “backyard”, highlighting the charm of the Shangdu Road waterfront area. Multiple functions are arranged along the Shangdu Road: the latest urban design interventions, new commercial activities, new landscape possibilities, new integrated urban activities. (1) A business development axis; (2) A vigorous pedestrian street axis; (3) A leisure landscape axis. 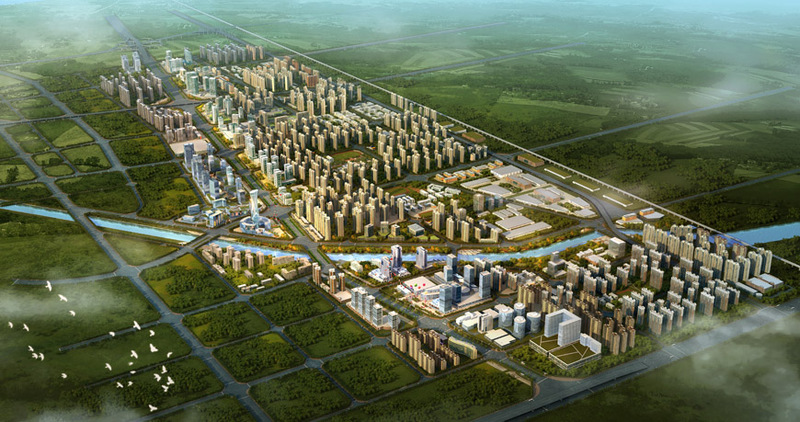 These axes will promote a balanced green system and harmonious environment in Zhengdong.